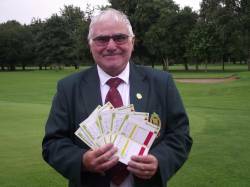 FIVE ROUNDS, 12.5hours; 17 miles, 90 holes; 346 nett score - what an achievement!! General Club Noticeboard : FIVE ROUNDS, 12.5hours; 17 miles, 90 holes; 346 nett score - what an achievement!! The above facts speak for themselves! Our Captain first tee'd off at 4.20am supported by his son Martin and son-in-law Simon. Bill Millichip joined the Captain for the first two rounds but fell by the wayside exhausted. Colin Talkes walked the third round with the Captain and video'd his game. We should get some great footage, to be used at an appropriate point in the Captains year, once Colin has downloaded it. Our Vice-Captain Alan and his wife, James Pegg, Frank Carter, Pete Bradley, Nigel Smith and Terry Adam all turned out to assist and support the Captain throughout the remaining final three rounds.He completed his 90th hole at 5.40pm having taken only a 40minute break throughout the day. He chose to refuse the buggy we made available to him and completed all 90 holes on foot. Many members generously contributed charity donations in the clubhouse and the Captain will be collecting the remaining donations from members over the coming few days. The bar has now been set extremely high and our future Captain's, who might be considering challenging this unique record, should firstly be getting medical clearance, spouse permission and psychiatric help!